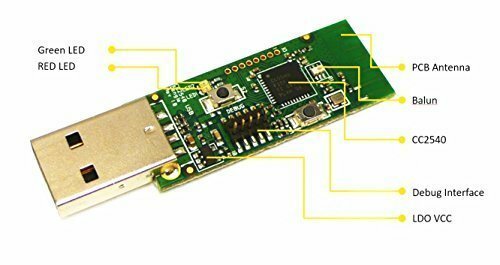 The CC2540 USB Evaluation Module Kit contains one CC2540 Bluetooth low energy USB Dongle. The dongle can be used to enable Bluetooth low energy on your PC. It can also be used as a packet sniffer for analyzing the BLE protocol and for software and system level debugging (use the free tool SmartRF Packet Sniffer). The dongle comes preprogrammed as a BLE host device monitor. To program and debug software running on the dongle, you need the CC Debugger or SmartRF05EB board (not included in the kit).